Cottage Home Decor uses USPS First Class shipping within the United States. Most orders will be shipped within 5 to 7 working days. Rush orders are subject to an additional charge; please email if you have questions. Shipping rates on orders of $100.01 or more start at $35; we will contact you to let you know what your shipping rates will be in for those orders. Please contact us for orders being shipped to any location outside of the United States. 8.75% Sales Tax for orders shipped to California addresses. We accept returns of undamaged, unused items within 30 days of order. Custom orders and tablecloths with umbrella holes cut out are not returnable. Please contact us for return authorization. Buyer is responsible for return shipping. Today’s Oilcloth is a printed vinyl front with a poly/cotton mesh backing. It is waterproof and stain resistant. Originally sold as a floor covering (as well as other uses) and better known as floor cloth, oilcloth was typically made from canvas sails and painted with oil paints. Other uses included water proof bags and protective wrapping for valuables while transported by stagecoach. 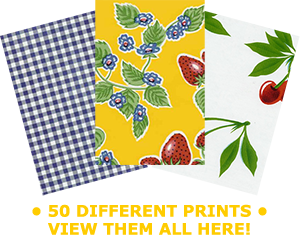 In addition, oilcloth was employed as shelf lining, roofing material for sheds, covering for work spaces, and tablecloths & bags, among many other uses. Just wipe with a damp cloth and air dry. Store folded, rolled or hanging, depending on the product. Note: Do not machine wash, dry or use an iron on any oilcloth product. In compliance with Prop 65; any product containing DEHP and sold in the state of California must have this warning: This product contains chemicals know to cause cancer and birth defects or other reproductive harm.